Silver brushed metal watch band fits for 22mm case openings with both straight end and curved end. Adjustable length at about 180mm with removable links. Heavy type strap at the thickness of appro.3.5mm. 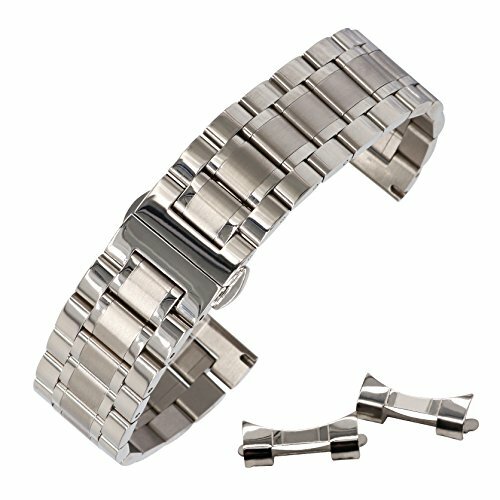 The watch bracelet is cut and crafted from premium 304 stainless steel with great care. Every detail has been taken into account in the manufacturing process in terms of workmanship,design and aesthetics. Quality construction with strengthend solid links make the band stand out. High-tech electroplating guarantees our straps retain their fantastic appearance for a long time. Brushed interior links companied by polished exterior links create elegant glamourous gloss and fine quality feel. Straight end and curved end combination ensure a higher compatibility to your loved watch. Popular deployment clasp with double push buttons gives you quick release and removal of the band.It is produced ergonomically to make a most comfortable wearing experience.